Do you intend to answer that for every question? Grand juries are used to threaten political activists in two ways: 1) by threatening prison time for those who refuse to talk about their political beliefs and political associations and 2) by using these threats, combined with secretive proceedings, to intimidate and disrupt the broader social movement. The real danger of grand juries targeting activists is that these two distinct types of threats feed off of each other. Prosecutors tell activists who have been subpoenaed that they can “make this all go away” if they just answer some questions about their friends, and their politics. When facing the real threat of jail time, it can be tempting for some people to sacrifice their political ideals and the needs of the broader movement in the name of self-preservation. At the same time, activist communities can get wrapped up in a martyrdom mentality, repeating hardline “no compromise” slogans without recognizing that there can be room to refuse cooperation while also attempting to minimize the risk of jail time. P: Do you know what a black bloc is? M: I am exercising my state and federal constitutional rights including the 1st, 4th and 5th amendments. 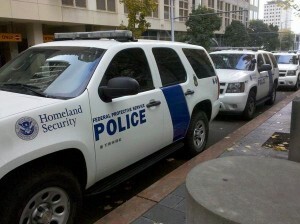 Homeland security outside the grand jury proceedings in Seattle. Photo from BecauseWeMust on Twitter. P: Have you ever been in a black bloc? P: Have you ever possessed a road flare? P: Do you know a man named ____________ (name redacted)? P: Do you intend to answer “ I am exercising my state and federal constitutional rights including the 1st, 4th and 5th amendments.” to all questions? I’m not advocating that this is how everyone should respond to a grand jury. I know there are some folks who have had extensive experience with grand juries over the last few decades, and adamantly oppose even entering the grand jury room. However, I wanted to highlight this because it is in such stark contrast to the behavior of Leah Plante, who also pledged to resist the grand jury, then refused to answer any questions about the terms of her unexpected release from jail, and instead left town. Pfeiffer’s response shows accountability and transparency; Plante’s fosters distrust. 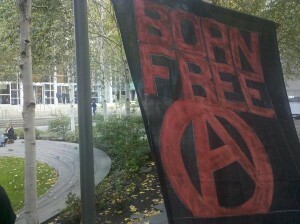 Banner outside Seattle grand jury. Photo from BecauseWeMust on Twitter. This has been a difficult issue for activists and their communities to navigate, and unfortunately the threat isn’t going away. Pfeiffer has a contempt hearing schedule for December 14th, at which point continued non-cooperation risks jail time. And at Pfeiffer’s court date, a subpoena was delivered for another person to appear before the grand jury. It appears that the subpoena was delivered to the wrong person, though. In many ways the most important way to prepare for new grand jury subpoaenas is to study how others have responded over the years. 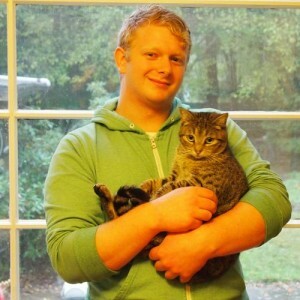 “In the animal and environmental movement, I was the second after Henry Hutto to be imprisoned for not testifying [in 1993],” said Jonathan Paul, former grand jury resister and Animal Liberation Front prisoner, in a recent interview. “Part of the resistance to the grand jury process is public outreach as this unconstitutional and fascist process spans to all walks of life, not just activists like me. Those who worked on freeing Henry after 45 days of not talking worked on my case so we knew the process better.